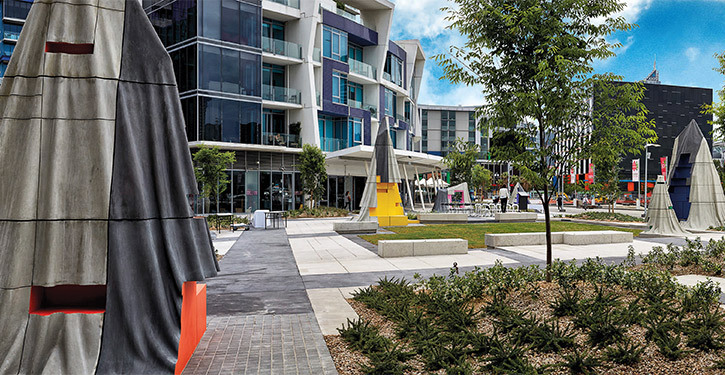 MAB Corporation has won the Urban Development Institute of Australia’s (UDIA) Victorian Award of Excellence for High Density Development for The Quays at NewQuay. MAB has now collected 11 separate awards for The Quays and is now a national finalist representing Victoria at the national UDIA Awards in 2015. The Quays is a mixed use development featuring 617 apartments and retail spaces, including The Sebel serviced apartments. Completed in December 2013, this landmark development has captured the attention of the design and architectural industry with its vibrant colour scheme and bold design. The Quays has received two property industry awards and nine architectural and design awards including two Victorian Australian Institute of Architects Awards, three Dulux Colour Awards including the major Grand Prix Award, Premiers Design Awards and Australian Timber Award. The Quays is now complemented by a 2000 square metre art and landscape project, Monument Park on NewQuay Promenade which was opened early December. Monument Park is MAB’s latest public art project at NewQuay and will be a visually dynamic public space for local people and visitors to meet, play, sit and linger, whilst enjoying views of Melbourne’s CBD and the water. MAB is currently working with McBride Charles Ryan architects on the next apartment development which is scheduled for release in 2015. To register your interest for the new project, contact the MAB sales team at sales@www.mab.com.au or 1300 137 590.